Provence-Alpes-Côte d'Azur (French pronunciation: [pʁɔ.vɑ̃.s‿alp.kot.da.zyʁ]; Occitan: Provença-Aups-Còsta d'Azur; Italian: Provenza-Alpi-Costa Azzurra) or PACA is one of the 18 administrative regions of France. Its capital is Marseille. the southeastern part of the former French province of Dauphiné, in the French Alps. The region logo displays the coat of arms created in the 1990s and which combines the coats of arms of the old provinces making up Provence-Alpes-Côte d'Azur. Economically the region is the third most important in France, just behind Île-de-France and Auvergne-Rhône-Alpes. Its GDP in 2012 was €142.4 billion ($US 183.1 billion) and per capita GDP was €28,861 ($US 37,121). The Marseille area is the most populous in the region with a city population of 850,636, an urban population of 1,560,921 and a metropolitan population of 1,720,941. Marseille is the second largest city in France after Paris, and has the third largest metropolitan population, behind those of Paris and Lyon respectively. Nice is host to the second-largest population concentration in the region, with a city population of 344,875 and an urban population of 1,005,230, making it the fifth-most populous city in France. According to a 2009 study, nearly 40% of all newborns in Provence-Alpes-Côte d'Azur in 2007 had at least one parent of an immigrant background - mostly Italian, Spanish, Portuguese and Maghrebi. This is the second-highest rate after Île-de-France (Greater Paris), where the figure was around 56%. Since the 1960s, the region has been a major immigration centre into France, mostly due to Mediterranean immigration from countries such as Portugal, Spain, Italy, Algeria and Morocco. Provence-Alpes-Côte d'Azur is divided into six departments. These are Alpes-de-Haute-Provence, Hautes-Alpes, Alpes-Maritimes, Bouches-du-Rhone, Var and Vaucluse. This region has a total area of 31,400 km2. It has a wide variety of landscapes, from the Alps mountains to plains and coastal areas like Nice and Marseille, which form the majority of the land area. The region has a Mediterranean coastline, on which the majority of its population lives. It borders Italy (Liguria and Piedmont) to the east, Monaco (Fontvieille, La Colle, La Rousse, Larvotto, Les Moneghetti, Les Révoires, Saint Michel) in the south-east, and the French regions of Auvergne-Rhone-Alpes to the north and Occitanie to the west. The Rhone, Var and Arc rivers run through the region. The borders were unaffectedby the 2016 French regional reforms. This region is very famous for the Côte d'Azur (French Riviera), which spans the glamorous cities of Nice, Cannes and Saint-Tropez. The Regional Council is the legislative body of the region. The President of the regional council has been Christian Estrosi (LR) since 2015. In the recent years Les Républicains (The Republicans) have gained strong support in the region and following the 2015 departmental elections, they control the region, which had been narrowly controlled by the Socialist Party with Michel Vauzelle (Parti Socialiste) previously. 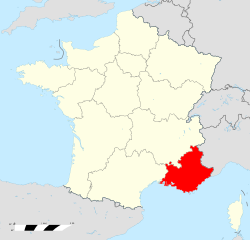 The French Communist Party historically had several strongholds in the region from the 1920s onward, including Aubagne, Draguignan, La Ciotat, Beausoleil, Martigues, Gardanne, Arles and some suburbs of Marseille. Though not enough to win the regional elections, the party usually received about 10% of the vote. Beginning with 2002 this declined to 4% and by 2012, dropped below 2%. The regional income per capita is close to the French national average. Income inequality however is higher than in other regions: the region is ranked 4th in terms of % of population living above the poverty line. The region is ranked third in terms of GDP. Between 2007 and 2011, the region registered an average annual growth rate of 1.6% in terms of GDP (Eurostat), close to the national average annual growth rate of 1.5%. Representing 7.2% of the national GDP over the period, the region is an important economic powerhouse. In 2013, the region was responsible for 7.4% of national employment, with an employment rate of 89.2%. The region's employment has two main characteristics: A higher concentration of elderly people than in the rest of France (respectively 27.1% and 24.1% in 2013); The unemployment rate was high in 2013, at 10.8% (the national rate was 10.3%). With more than 80% of regional employment in the service sector in 2010, the regional economy is mostly oriented towards service activities, above the national average of 76.3%. The sector grew between 2000 and 2010 (3.1% on annual average vs. 2.1% in France). While 49% of the labour force is employed in public administration (similar to the national level), the region concentrates more on commercial activities than financial ones; principally because of tourism. 34% of the labour force is employed in retail and trade, against 32% at the national level. Moreover, the sector strongly contributes to growth of added value (81.5% vs. 77.3% at the national level). The industrial sector, including construction, consists of 17.1% of regional employment (vs. 20.6% in the rest of France), and contributes to 9.3% of gross added value, 3.2 points below the French level. Employment in the agricultural sector is lower than the national level (2.4% against 3.1%). However, it grew at a rate of 4.1% annually on average between 2000 and 2008, while the rest of the country saw its agricultural employment decline (-2.4%). According to the French national statistical institute (INSEE), the region is characterised by a strong presence of SMEs of less than 500 employees, which represent 91.2% of local businesses (higher than the national average of 90.9%). Retail activities and tourism explain these figures. The region's economy is dependent on tourism like most coastal places but also a majority of its economy is dependent on coastal activities. Paca is the 3rd richest French region and ranks 19th on the European scale. Its prosperity is mainly thanks to its attractiveness in terms of tourism; it is indeed one of the world's favourite tourist destinations, welcoming about 34 million tourists every year. The service sector predominates and provides a good many jobs. In 2009, the region was admittedly affected by the global economic crisis, albeit to a small extent. It is (after the Paris area) the 2nd French region with regards to business startups. The motto of the region and its key to success could be summed up in one word: innovation. If tourism is the driving force of Provence-Alpes-Côte d'Azur, the region is also a leader when it comes to innovative sectors, such as high technology, biotechnology, and microelectronics. Education, for its part, is well developed with the region's various universities, international schools, preparatory classes for specialist university courses, and engineering and business schools. All these institutions of higher learning help contribute to the human capital needed by the region to meet current technological challenges. The region has a total GDP (2012) of €142.4 billion (US$183.1 bn), the third highest in France. It has a Per Capita GDP of €28,861 (US$37,121), slightly higher than the French average. According to a recent survey, a person living in Provence-Alpes-Côte d'Azur has an average annual income of about €37,489 (US$45,755). The region is in the center of a complex and dense motorways network, in the heart of mediterranean coast. Motorways are operated by ASF, ESCOTA, SMTC, MPM (Marseille Metropolis) and DIR Med (State). In PACA, motorways have the particularity to serve the city centers of big towns, unlike other big cities of France. A7 - Autoroute du Soleil "Motorway of the Sun" links the region to the North of France. This motorway starts in downtown Marseille at Porte d'Aix. The way grow to Septèmes Valleys to be connected with A51. After a junction with A55 and connectors highways A517, A551 and A552, the motorway crosses Vitrolles in 2x2x2 lines. It desserves the Marseille Provence Airport and the Aix en Provence TGV high speed train station. After 10 kilometers, the Berre-l'Etang petrochimic complex with a junction with D8 highway and arrives at the A7/A8 junction in La Fare les Oliviers. After the tool of Lançon-Provence, the road is linked with the A54 motorway in Salon de Provence. The motorway continue along Rhône and Durance to Avignon and Orange until Lyons. A8 - La Provençale, crosses the region from west to east to Italy. This motorway starts from the A7 at La Fare les Oliviers. The first part of free-road starts and cross Aix-en-Provence to be linked with A51 and N296 motorways. After the Palette Valley, the motorway arrives to the La Barque tool and the junction with the A52 to Aubagne, Marseilles-East, and Toulon. Crossing the Var department with the A8/A57 junction at Le Luc en Provence, the A8 gets a mountain profile to cross the French Riviera : Cannes, Antibes, Nice. A connection is made with A500 motorway at La Turbie to serves the Principauty of Monaco. After Menton, the motorway cross the Italian border until Genoa. A51 - Autoroute du Val de Durance "Motorway of the Durance Valley". The motorway starts with the A7/A51/A517 junction in the north of Marseilles between Plan de Campagne and Septèmes Valleys. 20 kilometers after, the motorway stops at the A8/A516/A51/N296 junction in Southern Aix en Provence. At Aix North, the motorway restarts and goes to rural South Alps after Manosque. It ends near Tallard, at 20 km south from Gap. A52 - Grand Contournement de Marseille "Marseilles Bypass". The motorway starts at the A8/A52 junction in the Aix Est (La Barque). It is a mountain 2x2 motorway built at 20 km around Marseilles. After the A52/A520 junction and Pont de l'Etoile, it ends at Aubagne, connected with A501 and A50. A54 - Autoroute de la Crau "Crau's Motorway'. This motorway starts at the A7/A54 junction at Salon East and the crossing of Salon de Provence with 4 exits, the motorway arrives at the Crau Plain. It ends at the N569/A54 junction in Saint Martin de Crau. It re-begins at Arles West to Nîmes, Montpellier and Barcelona. A55 - Autoroute du Littoral "Coastal Motorway". This motorway starts at Port de Bouc. After the Martigues bridge, the motorway passes at the south of the Berre pond in the Estaque Mountains After the A7/A55/A551/A552 junction at Les Pennes-Mirabeau, it crosses the mountains and arrives at Marseille (Estaque district). After the junction of Grand Littoral, the way crosses the new Euroméditerranée Central Business District with a long bridge of 7 km. Cars enters in the Joliette tunnel, continued by the Vieux-Port tunnel under the sea, and the Prado-Carénage tooltunnel. These three tunnels crosses the Marseilles city center. A55 is connected with A50. A57 - Autoroute des Maures "Arabic motorway". This motorways starts at A50/A57 junction after the Toulon tunnel. After the A57/1570 junction at La Valette du Var, the motorway continues along the plain of Maures to Cuers and Le Luc to be link with the A8. A500 - Tunnel de Monaco "Monaco Tunnel". This motorway starts at La Turbie (A8) at the West Monaco. The A8 goes over Monaco but A500 goes in Monaco with a 5 km tunnel to the principality. A501 - Aubagne bypass, connects A50 to A52. A502 - Garlaban motorway. This little motorway connects the A50 from Aubagne to Aubagne East to the Garlaban mountains. A515 - Junction from A51 to Gardanne. A516 - L'Aixoise. This motorway connects the A51 southern East Junction to Aix city center. N296 - Aix en Provence bypass. N569 - access of Fos-Marseilles Port. D6 - highway of Arc Valley from A515 to Rousset-Peynier Technologies center. D8 - access of Petrochimical area of Berre. D9 - Link between Marseille Provence Airport, Aix TGV high speed train station, the Arbois desert, the Europolis and Aix en Provence. The region is served by 13 high speed trains stations and one more in the Principality of Monaco. Two stations are situated on the HSL LGV Méditerranée opened in 2001: Avignon TGV and Aix en Provence TGV. The others stations served by high speed services are Avignon Centre, Arles, Miramas, Marseille Saint Charles, Toulon, Les Arcs-Draguignan, Saint Raphaël Valescure, Cannes, Antibes, Nice-Ville and Menton. Despite the importance of the region in the national economy and demography, the national services on conventional network are not very high due to the fact of the saturations of the tracks with high speed and regional trains. All regional trains services are operated by SNCF TER Provence-Alpes Côte d'Azur, except between Nice and Digne-les-Bains, operated by CP, the own-region company. The Regional Council of Provence-Alpes Côte d'Azur is the transport authority and defines the services in all region. An attractive fare permits to transport more than 100,000 passengers every day in 750 trains. In all relations, trains are lilting every 15, 20,30, 60 or 120 minutes with long interruption during 10am and 12am. With only one big line, the tracks are saturated causing delays or cancellations. The region has to rent other trains from other regions to respond at the offer. In 2016, during the second Council of the Year at the Region Hall in Marseille, in front of politics and the new president of the Regional Council of Provence-Alpes Côte d'Azur, the SNCF CEO, Guillaume Pepy, has announced the impossibility of the company to respond to the demand. The Saint Charles station, the Marseille's main railway station can't support more than 23 trains an hour and the tracks are too old and not enough to accept an average of the capacity. The project of new line LN Provence Alpes Côte d'Azur in 2030 could permit to increase trains on tracks with a new crossing of Marseille with a tunnel. Two new stations will be created in the territory of the city and a new line between Cannes and Nice Airport. Due to motor vehicle traffic, the urban areas are saturated every day. In July 2016 during Bastille Day Celebrations in Nice, a terrorist drove a truck through crowds of people at the Promenade des Anglais. The largest cities in the region are Marseille (administrative capital city of the region), Nice, Toulon, and Aix-en-Provence, each with a population exceeding 100,000 inhabitants at the 1999 census. Along with Marseille, Nice is the second most important city in the region with a city proper population of about 350,000 and an urban population exceeding 1 million. Marseille with an urban area of 2 Million inhabitants, is the largest and capital city of Provence-Alpes-Côte d'Azur Region. It is also the second most populated city in France, just behind Paris and the city with the third largest metropolitan population in France, behind Paris and Lyon respectively. Along with Nice and Marseille the region is also made internationally popular with Cannes which, though not a large city (population of 73,603 in 2012), hosts the annual Cannes Film Festival which has highly popularized the region. Also, Arles has become renowned as the city in which Vincent Van Gogh lived and painted 300 paintings. Toulon is a large military harbour on the Mediterranean coast, with the French naval base placed there. It is the capital of the Var department in the region. Also, Aix-en-Provence has long been a university town, and to this day remains the most important educational centre in the region. Below is a list of the most populated cities in the region along with their population (city proper) according to the most recent census. ^ INSEE. "Produits intérieurs bruts régionaux et valeurs ajoutées régionales de 1990 à 2012". http://www.insee.fr/fr/themes/detail.asp?reg_id=99&ref_id=pib-va-reg-base-2005. Retrieved 2014-03-04. ^ (January 2009) "Neonatal screening for sickle cell disease in France". J. Clin. Pathol. 62 (1): 31–3. DOI:10.1136/jcp.2008.058867. PMID 19103855. Wikivoyage has a travel guide for Provence-Alpes-Côte d'Azur. This page uses content from the English language Wikipedia. The original content was at Provence-Alpes-Côte d'Azur. The list of authors can be seen in the page history. As with this Familypedia wiki, the content of Wikipedia is available under the Creative Commons License.